When I married Jack, I left my ancestral home and came up here to Toxaway. This place was settled by Jack’s great grandfather in the 1860’s the best I can determine. 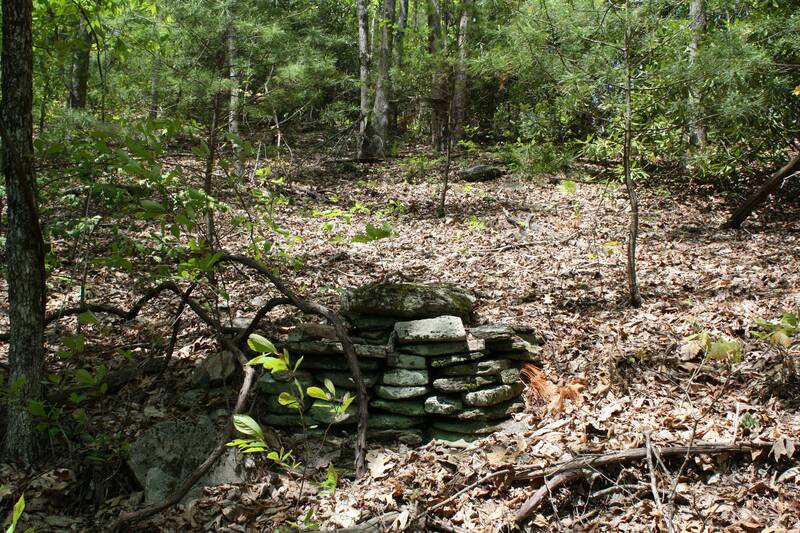 There is an oral tradition that the ruins of an Indian settlement (teepees) were found here. Since the Cherokee did not use teepees, my first impulse was to debunk the story. However, right away I found an arrowhead, whether Cherokee or not I have no idea, but maybe…after all, the Cherokee liked the cooler climates in summer and often went to the uplands to raise their corn and pumpkins. But it was not the Cherokee who left a mark on this land. It was Jack’s grandfather, Bud Lee. Almost everywhere I go I see some evidence of the work he did to coax from it a living for his family. Bud Lee’s father W. S. Lee purchased around 200 acres here. He deeded off some to his daughter Caroline and her husband Slick Fisher. Later on his son Bud Lee deeded off several acres to family members. Jack sold some after he got it, so now there are only fifty some acres in this tract. In that process you had to remove the rocks also. I was poking around in the woods yesterday, exploring a little swale that caught my eye. Tall trees surrounded me, interspersed with large rhododendron shrubbery. Who would have thought that crops would have ever been growing here? But, to my right I spied a long row of rocks, not quite covered by leaves. I recognized Bud Lee’s trademark. Neat stacks of rocks, one on top of another in perfect order. This one was long, but very neat and so well stacked that after a hundred years very few were awry or out of place. I could not help but smile. Here at the edge of his mountainside cornfield, Bud Lee had made this stack of stones gathered out of his field. Above is a photo of a smaller stack I found earlier. At this location I found some rough piles and two very nice ones like this. This pile of rocks probably has not been touched since he put them there. Another thing I notice is terracing, not just down low where the fields still are, but on the steeper slopes in the woods also. Terracing did wonders to prevent erosion, and in plowed fields terracing prevented the loss of good topsoil, especially in steep places. Another thing I have noticed: there is the faintest evidence of an old road cut through the lower end of the field west of the house, and the rotted timbers that supported a bridge over a little swampy spring run. I never have asked anyone about that. It must have been just a farm road. However, I understand the original road to Gloucester was not in its present location to start with, but came up a little to the south, and closer to the houses on this side of the road. 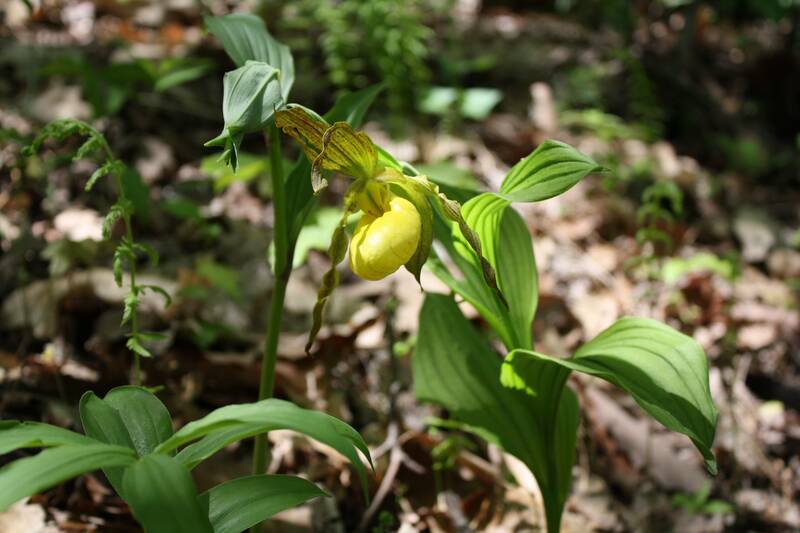 At the top of the page is a photo of a beautiful yellow lady’s slipper I found recently. It is the first one I ever found for myself.